Marine gears meet a wide variety of marine applications in a variety of configurations and installations to meet the most critical applications. They are used in yachts, work boats, fishing boats and other marine applications. Selection of the appropriate viscosity grade for marine applications is based on speed, load, operating temperature, and gear geometry. The viscosity required increases as the speed decreases. Specific marine applications include main propulsion, centrifuges, deck machinery such as winches, windlasses, cranes, turning gears, pumps, elevators, and rudder carriers. 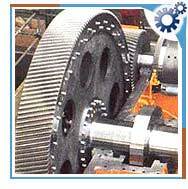 Bevel gears - They are used as special reduction gears for cruise. They are also used for transportation task. Helical gears - Transmit power and motion between parallel axis. Planetary gears - These are used foT co-axial drive.